This guide is for controlling nuisance armadillos, why they are attracted to your yard and proper procedures of live animal trapping for them. Armadillos can become a nuisance on your yard and garden in their continuous search for their favorite food supply, worms, insect larvae, pupae and other soil insects. Armadillos are 15-20 inches long, about 8 pounds and gestation period is 150 days. They can have 4 young in a litter and have 1 litter annually. Main food source is insects and other invertebrates, small reptiles and frongs, and fruit. Armadillos find nesting in stone piles and around trees or shrubs and under slabs ideal. Their burrows are usually15 to 25 feet long and cause extreme damage to tree roots. They can cause root damage to trees and shrubs by digging. Indirect control of the armadillo has been proven effective by eliminating as much of their food source with a turf insecticide. When they are a continuous problem in your garden then exclusion may be deemed necessary and is effective when done properly. Armadillo trapping might be difficult and many distinct factors go into the placement of the live animal trap what direction it will be traveling, and most importantly, its behavior and response to a trap. The right sized trap must be used – preferably a large cage trap intended for raccoons and other large animals. 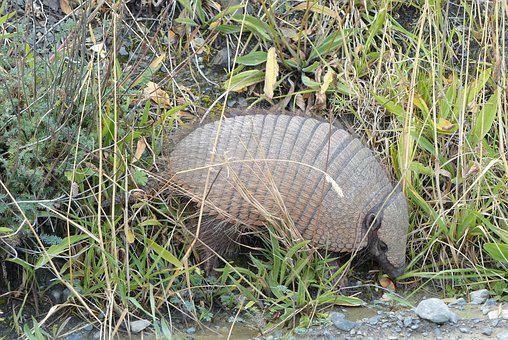 Armadillos can be quite tough and strong aniamls so the trap has to be sturdy. The armadillo won’t enter a trap for any kind of food and you will be more effective at ridding when you’re forcing the animal in the trap. They will typically be walking along edges around their burrow. The Havahart trap can be made more effective by using two long planks on edge to form a funnel which herds the armadillo within the animal trap. Set the trap along their path and use directional barriers – boards of timber, fences, concrete blocks that will funnel the poor-sighted armadillo into the trap. Havahart animal trap can be baited with rotten fruit, such as pears, bananas and apples. Some people find that a small amount of ground meat or an egg is effective in certain situations. Trapping for Pest control can be a look and learn procedure, not all recommendations work for situation. There are many websites which offers a full line of professional pest control services including glue traps, mouse traps, animal traps for squirrels, moles etc. for your entire Do It yourself Pest Control needs. You can now use the same products the professional pest control technicians use at a fraction of the price tag. Did you know these are myths?